We’ve had so many bloggers baking for International Scone Week! Please keep checking the original post – I’ll be updating the list daily and doing a round up post with all the photos on Sunday! I have a bit of a crush on Chef April Bloomfield. So…how does one do justice to the perfect Caesar salad recipe? ….and adding a few of our favourite Italian anchovy fillets. As instructed, I ate the salad with my hands, rubbing the dressing over each leaf before curling it around a crouton or a tiny bit of anchovy. It was so good that I made it again the following day, as I couldn’t bear to waste the leftover dressing! Instead of crushing the ginger ice block in the food processor, I popped it into a thick plastic bag and bashed it with a rolling pin. It worked well, and the end result was wickedly good! I know what I’m having for lunch!!! Thanks for that easy approach to a caesar dressing. The other ingredients are outside my back door. Hooray! We had it again on the weekend as well (garden full of cos lettuce!). Thanks for introducing me to April. What a delight and her Moscow mule looks so delicious – bring on the summer. What a delicious looking salad. I miss our lettuce in the garden! Your lettuce looks so wonderful, as does that drink. Oh I have those lovely cos leaves from you to make into a salad today! :D Great idea as I feel like salad! Her radish salad with basil, Parmesan, and lemon is also fantastic. Thank you! I’ll look out for it! I love a classic Caesar but have not liked some of the so-called ‘deconstructed’ versions which use the name but have little to do with the original. 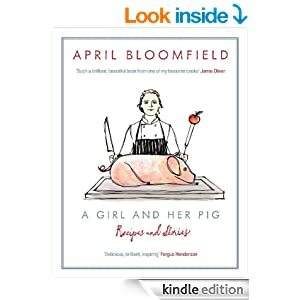 Had not heard of April Bloomfield either to tell the truth! This recipe really is definitive and perfect and plated in a way I can understand. Back to copy her dressing exactly :) ! Eat with hands: of course . . . almost everything solid: it DOES taste much better! Wicked!! And cool! The Moscow Mule is pure fun – in fact I can imagine I would find it shriekingly good fun. Caesar salad is my favourite salad and the way you have done it looks so good – I enjoy a finger lickin’ salad and cos or romaine make that possible. I’ve never tried fried parsley – so must give that a go. Had not heard of her but I like what I see! And as for your salad and cocktail – with the freshest of ingredients, you don’t need a list a mile long of things to cook with to produce the best tasting food :) Just about to sort out my scone recipe post…. I make Caesar salad often using a similar dressing, but don’t think I’d use my fingers to eat it. I tend to like lots of dressing, so it would be a bit messy! I love Caesar Salad! It’s simpler than other salads but the taste is classic! Hi Celia, your salad looks good but that Moscow Mules sounds fabulous. I lover Caesars that include anchovies, it’s the only way I’ll eat them– I am such a snob, haha. But, fried pig ears?! I need to find myself a copy of this book. I know… :) How can one resist a book like that? Sounds RIGHT up my alley Ms Celia. I love ginger and the heat of good ginger is what makes me keep coming back. Jody, I’ve been lucky lately – so often cookbooks disappoint me, but the April one and the David Tanis ones have been absolutely fantastic. I think April has a vegetarian cookbook coming out later this year as well! I’ve never eaten a salad with my fingers but now I want to. The description of your salad made me swoon. Now that’s a Caesar salad! I could see having that with dinner just about every night. It’s funny you mention a Moscow Mule since my daughter was saying that she thought she might have those as her special bride’s drink at the wedding. I’d never heard of them before and now it’s popping up everywhere. I’m going to have to make you a Bostonian though Celia – when we really like something we say it’s WICKED good. I know you’re more proper with wickedly but in case you ever make it over here to the states, let’s work on it…wicked good, wicked good…. All right Celia! Don’t forget too that you drive your cah and pahk it.